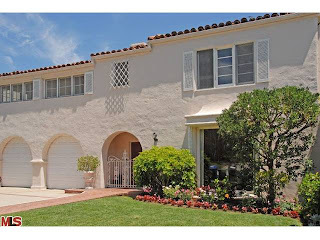 The Westwood Little Holmby home at 854 Thayer Ave, LA CA 90024 lasted approximately 152 days on the market before accepting it's final offer on 9/13/11. During both the 2010 and 2011 listing periods, there were several accepted offers (escrows) that turned out to be unsuccessful at closing. Even though the home is very clean and in livable condition, most people would consider this home a fixer with it's current condition. Most likely needing upgrades to all the systems as well. A few things that potentially contributed to a difficult sale was being a fixer and needing lots of work, but the topography of the downward sloping lot with the backyard/pool much lower than the house (down a couple flights of stairs) also isn't as desirable a feature. If you look at the attached photo, the subject property has the orange pin. Where the orange pin is, that is the deck off the main level of the house. Then you have to go down that flight of stairs to a patio area and then down another flight of stairs to the pool. At the end of the day, I think the sales price indicates a good deal for the new buyers in one of the most desirable neighborhood locations to be in. 854 Thayer ave closed on 10/19/11 for $1,475,000.